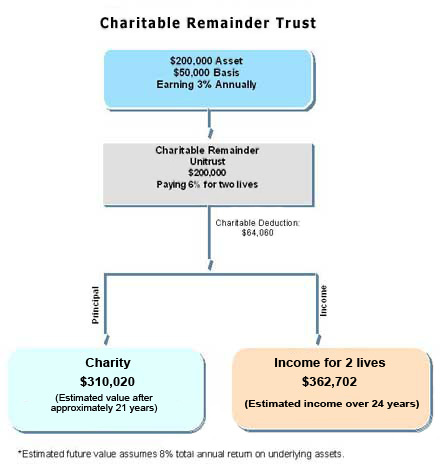 The charitable remainder trust is one of the most efficient estate planning tools for people holding assets that have appreciated significantly, like stocks, real estate, or a business. The charitable remainder trust (CRT) was created in the Tax Reform Act of 1969. It's an irrevocable trust designed to convert an investor's highly appreciated assets into a lifetime income stream without generating capital gains taxes. CRTs have become very popular in recent years because they not only represent a valuable tax-advantaged investment, but also enable individuals to provide a meaningful gift to one or more charities. When you establish a CRT, you and/or another beneficiary, such as your spouse or another family member, receive income from the trust for life or a term of up to 20 years. In addition, you receive an immediate charitable income tax deduction for your gift. Any capital gain from the asset utilized to fund the trust is averted, and the asset is eliminated from your estate for estate tax purposes. 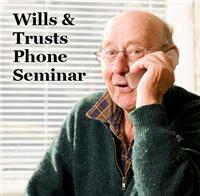 When the trust ends, the remaining assets pass to the qualified charity or charities of your choice. Winona and John McCarty have rental property that they purchased as an investment many years ago for $50,000. John is quite handy and has been able to do a lot of the upkeep himself. The property returns about $6,000 per year, and has appreciated significantly since they purchased it. It is now worth $200,000 and is totally debt-free. John and Winona have been very happy with this investment but they are 70 and 65 years old respectively and would welcome a transition to a more passive investment. They are very charitable, and recently heard about a Charitable Remainder Trust from a ministry that they support. They decided to establish a charitable remainder unitrust that will pay them 6 percent a year for their lifetimes. To do this, John and Winona place their real estate into a Charitable Remainder Unitrust. The trustee sells the assets and reinvests them in stocks and bonds. Each year, John and Winona receive 6% of the trust value. This amount will actually increase annually as long as the assets in the trust achieve a rate of return above 6 percent per year. John and Winona will receive an immediate charitable deduction of approximately $64,000. They will also avoid the capital gains tax that they would have paid had they sold the assets themselves, and the assets are removed from their estate, saving possible estate taxes. Finally, Winona and John have the pleasure of knowing that at the end of their lifetimes, the remainder interest in the trust will benefit a ministry that they hold dear. For assistance in creating a charitable remainder trust, or to explore your options (click here).